Not everyone can have the boat of their dreams, but that’s OK. With some basic items your current boat or next boat can be an excellent tool for offshore fly fishing. Rigging your new or used boat for offshore fly fishing can be as simple or as complicated as the flies we tie for the game fish we pursue. 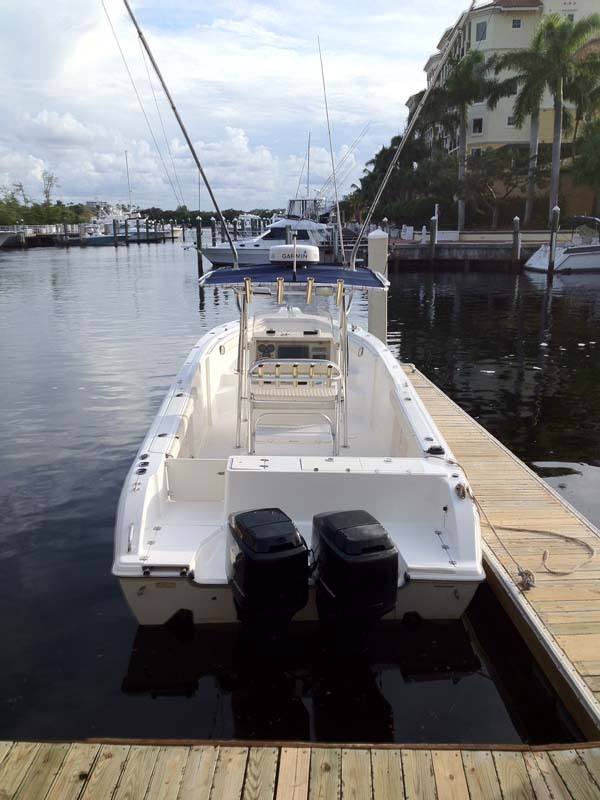 For some, all you will need is a boat capable of handling offshore seas with a deep V hull (or catamaran if you prefer) and some rod holders for fly rods. For others, like myself, things get much more complicated and can be much more expensive. Many articles have been written about boat hulls, various designs and every manufacturer out there states they have discovered the most stable, easy riding hull ever developed. Here’s what you need to know. Don’t go offshore with a flat bottom boat unless you are staying close to shore and know the seas will be completely flat. If your not a person who likes to gamble, that save yourself the worries and buy a deep V hull, which I prefer over catamarans. Deep V hulls are designed to drift, troll, run in head and following seas offering the most amounts of function and comfort. If you are serious about being offshore, spend a few extra bucks and buy a deep V hull. Trust me, you wont be sorry. Another option is a catamaran. These are great boats and very stable. I have fished on them a few times and their wide beam is really comfortable. However, I have found that they are a “wetter” boat when running in a head sea. Another must have is an engine unless you enjoy rowing for hours. One engine is good, but two engines are better. My boat has twin engines. I like the added security of knowing that if for any mechanical reason I lose an engine I can still be in control of the boat and keep it off a jetty or reef. However, I fished from a single engine boat for years and with the technology of four stroke engines they are very reliable. The choice is yours. Every boat I have owned has a T-Top which is my best friend. Out of all the things I “need” offshore the T-Top is something I cannot do without. It is the only source of shade and protection from rain and provides a solid platform to hold a GPS antenna, radar antenna, outriggers, etc. However, you may not want a T-Top. If your boat is less than 23-feet long, a T-Top may get in the way of casting a fly rod. For me-its on my must have list. My rule of thumb for a T-Top is go stronger in the pipes than you think you will need because several antennas and outriggers will add a lot of weight to the top. Cleats are highly overlooked when rigging a boat for fly fishing. Every boat must have cleats, you can take them off yourself, but good luck tying up to your local dock without them. But, you do have a choice in the cleats you use. I strongly recommend the cleats that are cut into the gunnels and pop in and pop out. When they are not in use they pop into the boat so they are fish with the hull, most importantly when they are popped in fly line cannot wrap around them. Huge benefit right there! My boat does not have pop out cleats and I frequently lose fish when the line wraps around the cleat. Almost every boat on the market some with rod holders…one problem here, the standard rod holders will not hold a fly rod. Luckily, there is a simple solution, you can make a fly rod holder out of PVC pipe if you’re not a ten thumbed guy or or buy a pre-made one from Birdsall Marine or your favorite yard. The product doesn’t show on their website so just call their 800 number and talk to a salesperson. A small item that everyone forgets to ask about are trim tabs. A trim tab are a plate on each side of the boat that move up and down and assist in leveling the boat when traveling above cruise speed. Are they necessary, no. Will you want them-absolutely! 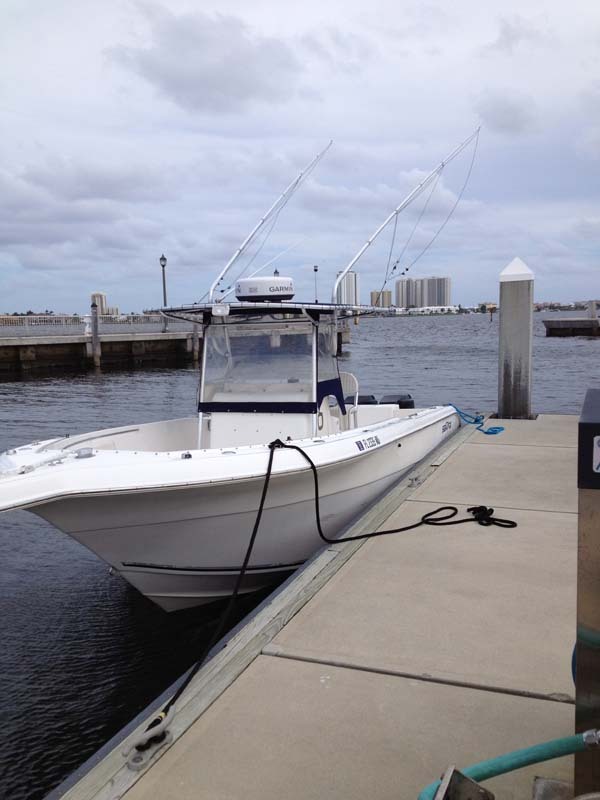 When I am alone on my boat (28-feet) I never use them but when I have two to three anglers on the boat and they are all leaning on the same rail, they come in handy in keeping the boat nice and level while decreasing the amount of fuel I am burning. When you offshore you bring your own power with you, my boat has four batteries. I wont use less than four batteries with twin engines. I need to know all my electronic, running/anchor lights and engines will have plenty of power when I need them. Two batters are the minimum I would recommend to ensure after a full day of drift fishing with your fish finder on you can still start the engine. On my boat, M’Ocean Grant’d, I have a huge live well because I use live bait a lot. If you don’t use live bait frequently, than this is an option you can either omit or not pay much attention to. My live well is large, circular and does not have a clear top. I don’t like clear tops, I feel they enable the sun to beat down on the bait and heats the water temperature up too much and thereby slowly killing my costly-frisky live bait. My bait well pump runs at 1100 gallons per hour. I would recommend not having one that is less than 500 gallon per hour to ensure that your live bait get proper oxygen. My boat has a large cooler for food and drinks. My next most important consideration is kill boxes. Personally, I don’t eat a lot of fish, but my wife loves fish and as such I must make sure to bring home fresh, cold fish. I have two in deck kill boxes and two above deck kill boxes. All four have macerator pumps and will keep over 1000 pounds of fish ice cold. They are large enough where I can keep tuna, wahoo, kingfish and the like completely in the boat with the lids securely fastened. A cold box will lose its cold temperatures amazingly fast if the lid is even slightly open. I personally prefer Yeti Coolers. I’ve kept this as simple as possible – basics actually. I’ve been around boats since childhood and as many of you with a lot of on-water time and boat owner-offshore fishermen, as well, realize we could make the subject into a book.